W.C. FIELDS STRAIGHT UP is the definitive feature-length celebration of the movies’ best-loved curmudgeon. 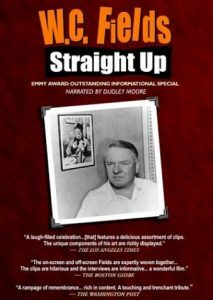 This Emmy Award-winning documentary traces Field’s life from his childhood in Philadelphia, through his years of Hollywood stardom, to his final days. Interviews with Fields’ closest friends, family and collaborators are interwoven with beautifully remastered clips from his best-loved films and his rarely seen screen appearances. The resulting film presents Fields as both a brilliant comedian and a troubled, stubborn, loner. Billing himself early in his career as “the world’s greatest juggler,” Fields quipped his way to stardom and, by 1938, had become the sixth highest-salaried person in the United States. Though he abandoned his pregnant wife to pursue his career, and was estranged from his son for thirty years, Fields’ onscreen charm made him into a hero for the masses. Did he really hate dogs and children? Did he really drink a quart of gin a day? STRAIGHT UP dispels some of the famous myths and sheds light on many lesser-known facts. It highlights Fields’ most colorful antics and quotes, both onscreen and off. For 93 minutes, W.C. Fields comes back to life in this probing and hilarious “warts-and-all” account of a man and an entertainer so distinctly himself.